As my Canadian readers know, this weekend is a holiday weekend with Canada Day falling on the Monday. For many of us, that means a fun weekend full of BBQs, camping, fireworks, the beach, and spending time with friends and family. I'm not sure how many of those things I'll get to squeeze in, but I'm looking forward to a relaxing long weekend! 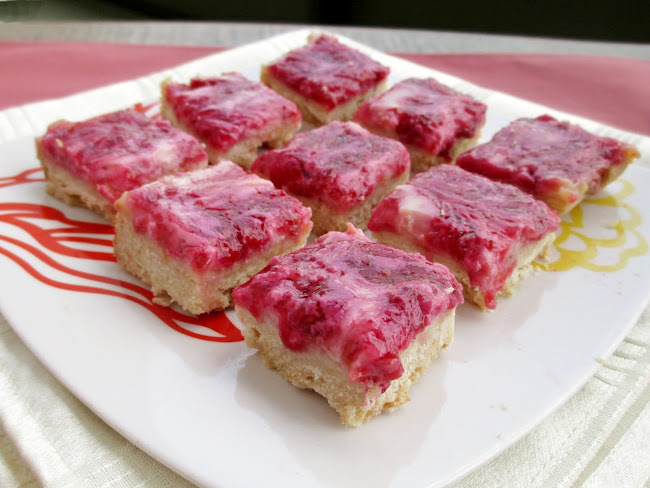 And to celebrate the holiday on my blog, I wanted to share some kind of treat that would work either as a Canada Day recipe or just as a regular treat (since I know most of my readers are not Canadian). Strawberry shortcake isn't necessarily known as being a "Canadian" dessert, but it's something I grew up with and have always loved. To me, it's a symbol of both Canadian summers and the local strawberry picking season - both of which have always seemed far too short! Every time we came home with a basket of freshly picked strawberries, my sisters and I would request strawberry shortcake for dessert - a pillow of buttery, flaky biscuit topped with sliced strawberries and lots of whipped cream. I remember savouring every bite as we sat outside enjoying the warm weather, and trying to coordinate each of my bites so that I wouldn't run out of strawberries too quickly! Now that I'm a bit older, I still love the traditional strawberry shortcake that I grew up with, but I wanted to create a new version using all vegan ingredients, since I prefer baking without dairy. 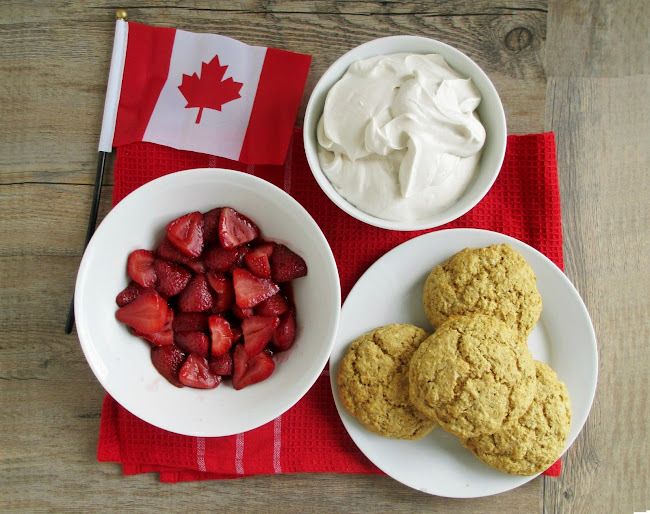 I also wanted to play up the Canadian theme, so I incorporated maple syrup - one of the well-known culinary symbols of Canada - into every component: the shortcakes, the strawberries, and the whipped cream! The shortcakes, based off a recipe from The Healthy Everythingtarian, are made with coconut oil and soy milk instead of butter and cream, and I added a bit of maple extract for extra flavour. Next was the strawberries - rather than just slicing them up, I wanted to make them a bit more special by roasting them in the oven with maple syrup and vanilla to get an even more concentrated flavour and make them nice and soft and juicy. Finally, I made a fresh batch of coconut milk whipped cream (see posts from other blogs here and here if you're not familiar with this idea). Instead of flavouring it with powdered sugar and vanilla like I usually would, I used maple syrup as the sweetener, along with a splash of maple extract. 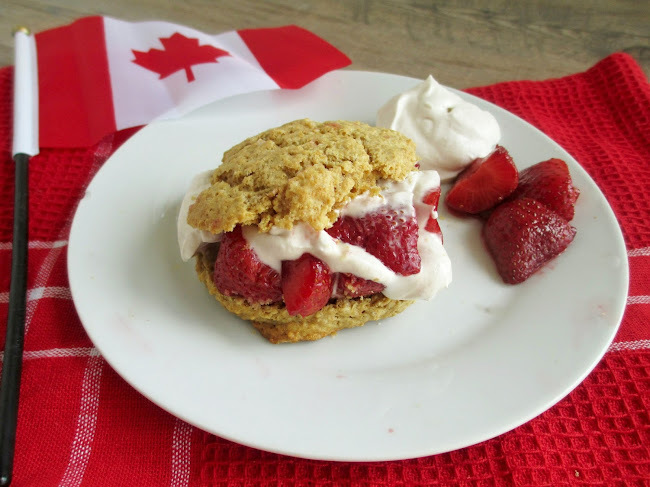 Eating the maple shortcakes together with the roasted strawberries and maple whipped cream brought back memories of all the summers past when I would enjoy my strawberry shortcake desserts, but with new tweaks and flavours that made this version memorable in its own way. I couldn't wait to dig in as soon as I finished taking photos of it, and I loved everything so much that I immediately went back for a second serving, telling myself it's acceptable to eat two helpings for breakfast! 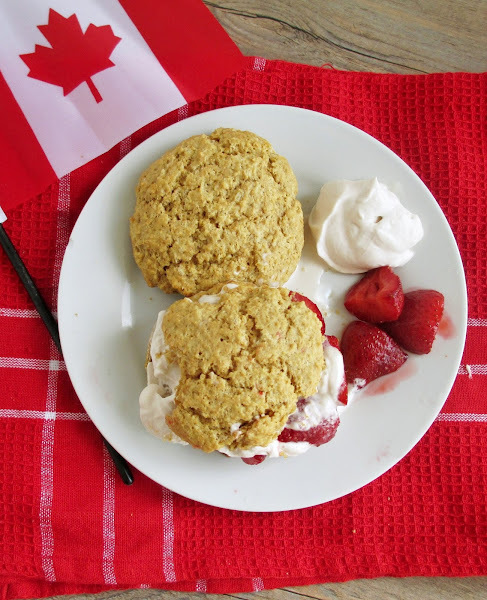 I was impressed with the texture of the shortcakes - they were soft yet crumbly, and I loved the sweetness of the maple to make them more of a treat than plain biscuits. The maple flavour was subtle throughout but still noticeable, and I loved the way the roasted strawberries just melted into the shortcake and the whipped cream. 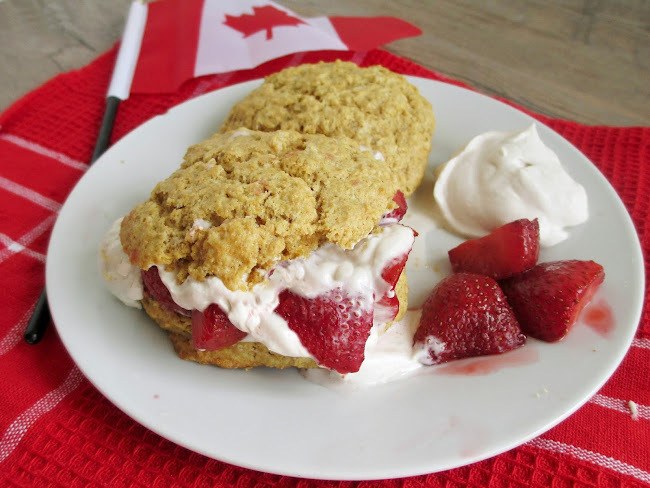 I think this would make a great addition to a Canada Day meal for those of you who are celebrating the holiday this weekend, or just a great finish to a summertime meal any day! 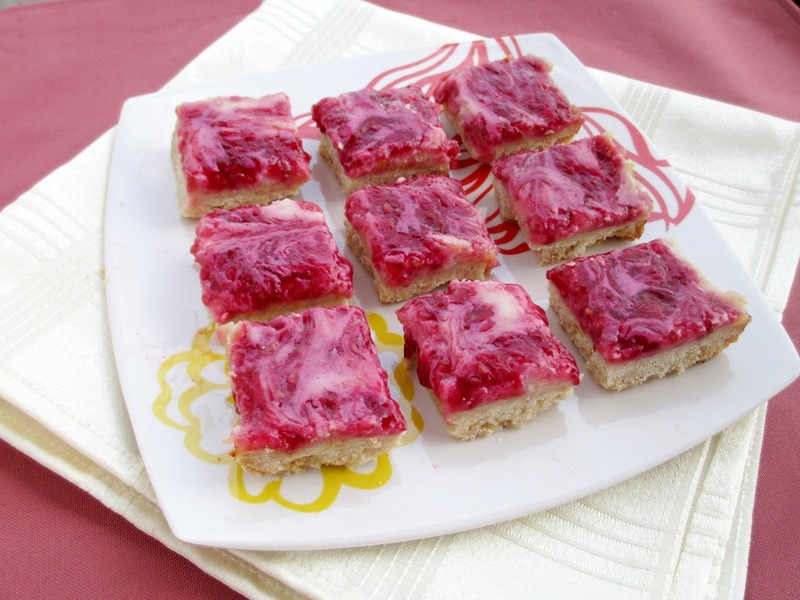 Toss the halved strawberries with the maple syrup and vanilla. Transfer mixture to a small baking dish and roast in the preheated oven for 15-20 minutes, until the berries are softened (but still hold their shape). Remove from oven and set aside. Keep the oven turned on. While strawberries are roasting, prepare the shortcakes. First, mix the milk and lemon juice together and set aside for at least 5 minutes. In a medium sized bowl, whisk together the flour, baking powder, baking soda, salt, and sugar. Add the coconut oil and use a fork or pastry cutter to cut it into the dry mixture, until it becomes dense, moist crumbs. Add the milk mixture and maple extract and stir just until the wet ingredients are incorporated. Use a 1/4 cup measure to divide batter into four equal biscuits. Drop biscuits on a baking sheet lined with parchment paper, patting the dough into round shapes. (Tip: If your kitchen is warm, you might want to stick the baking sheet in the freezer for 5 minutes before baking to help the biscuits keep their shape and prevent them from spreading too much in the oven). Place baking sheet in the oven and bake for 12-15 minutes, until biscuits are lightly browned and a bit firm on top. Let cool on a wire rack. While shortcakes are baking, prepare the whipped cream: Open the chilled can of coconut milk and scoop out the thickened cream portion on top into a bowl (leave the water in the can behind - you can drink it or discard it). Use a stand mixer or hand mixer to whip the cream until it becomes thick. Add the maple syrup one teaspoon at a time, beating it in after each addition, until you reach your desired sweetness level. Add the maple extract and beat again, until you have semi-stiff peaks (mine didn’t get quite as firm as regular whipped cream, but it will thicken up more in the fridge). To serve, place a warm biscuit on a plate (you can slice it in half horizontally if you want). Top with one-quarter of the roasted strawberries and a generous helping of whipped cream. Repeat with remaining biscuits. Makes 4 servings, plus extra whipped cream*. *Note: the leftover whipped cream goes really well as a dip for fresh strawberries on their own too! 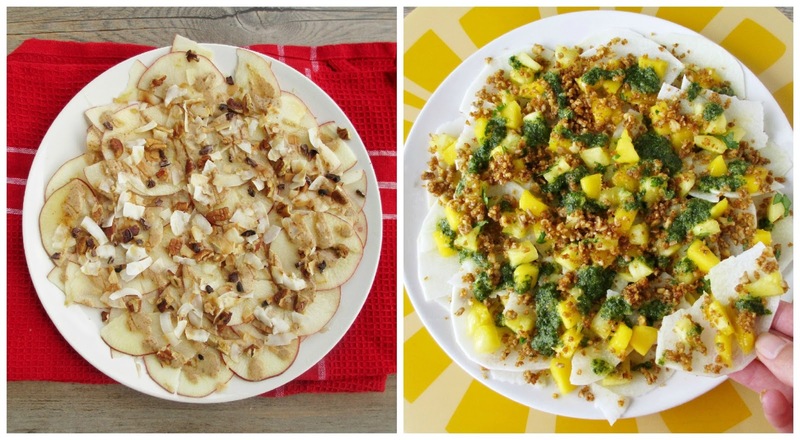 One question I get asked the most as a blogger is where I get the inspiration for my recipes. My answer is never a simple one, as my inspiration comes from many different sources: the farmer's market, the seasons, cookbooks, and other blogs. With these cookies though, my inspiration was super specific, since I wanted to try to recreate an energy explosion cookie that I had tried recently. I'm not sure if they're only a local treat, but I've seen them around town at organic stores and bakeries, sold as a healthier treat option. 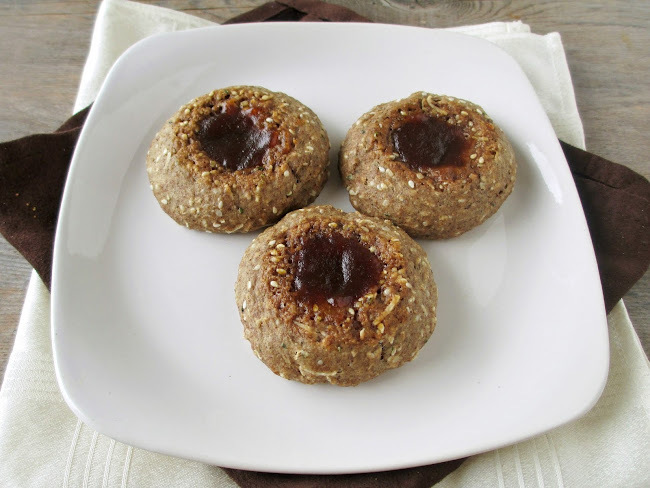 The version that I tried was gluten-free, made with brown rice rice flour, ground almonds, sesame seeds, and a bit of maple syrup and cinnamon for flavour. 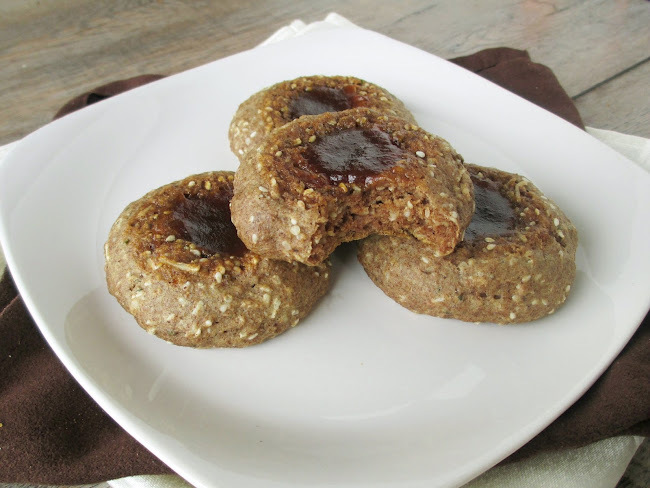 What I liked the most about them was the rich, velvety apple butter filling in the centre, which made these different from the usual thumbprint cookies that are filled with jam. It took me a few tries to get my cookies right (which is why they look slightly different in these photos! ), going from dry and overbaked to too soft and muffin-like with no flavour. While the final version is still not exactly like the original, I'm happy with my homemade knock-off! My cookies are made with whole grain spelt flour, with a mixture of sesame seeds, hemp seeds, and coconut for texture. I added a bit of almond butter and pure maple syrup for flavour, and a generous spoonful of apple butter in the middle. I liked that the cookies themselves aren't too sweet, since the apple butter adds plenty of natural sweetness in each bite. 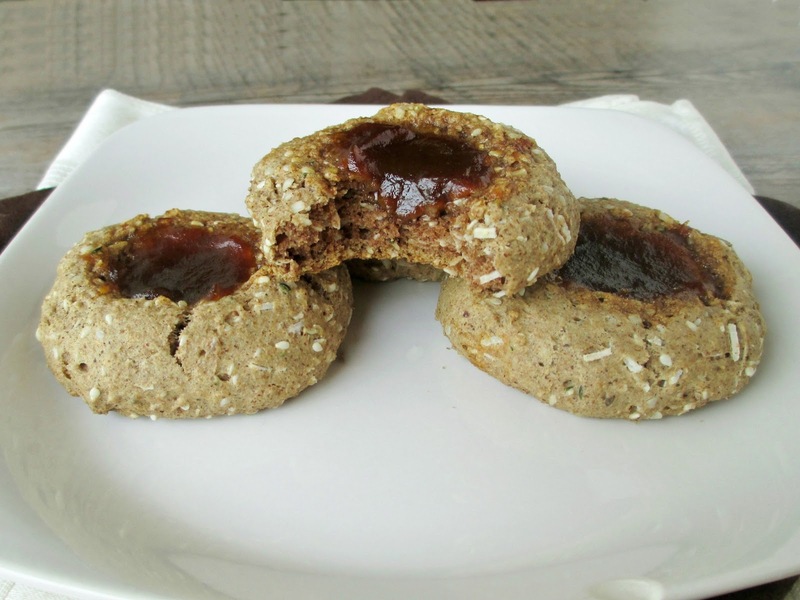 These are more of a soft cakey cookie, with lots of texture from the seeds and coconut. And the best part is that all of the ingredients are healthy, especially the hemp seeds which are full of protein, fibre and vitamins, so you can feel good about eating these as a nutritious snack! Preheat oven to 350°F and prepare a baking sheet by lining with parchment paper. Whisk the dry ingredients (flour to sesame seeds) together in a medium sized bowl. In a separate bowl, mix the wet ingredients (maple syrup to coconut oil). Gently mix the wet ingredients into the dry ingredients, stirring just until the dry ingredients are incorporated. Place dough in the fridge for 10-15 minutes to firm up. Roll dough into equal sized balls (I got eight balls) and set them on the prepared baking sheet. Press down in the centre of each ball using a 1/2 tsp measure or your thumb to flatten the cookie and make an indentation. Fill each indentation with a heaping 1/2 tsp of apple butter. Bake in the preheated oven for 11-13 minutes, until firm and lightly browned. I like to add a bit more apple butter to the centres once they come out of the oven because the filling will have reduced a bit in the oven. Let cool on a wire rack. *Note: hemp seeds can have a slightly bitter taste, so if you've never used them before or you don't like the taste, you can just leave them out of the recipe (I didn't notice any bitterness, but my sister did when she tried one of the cookies). 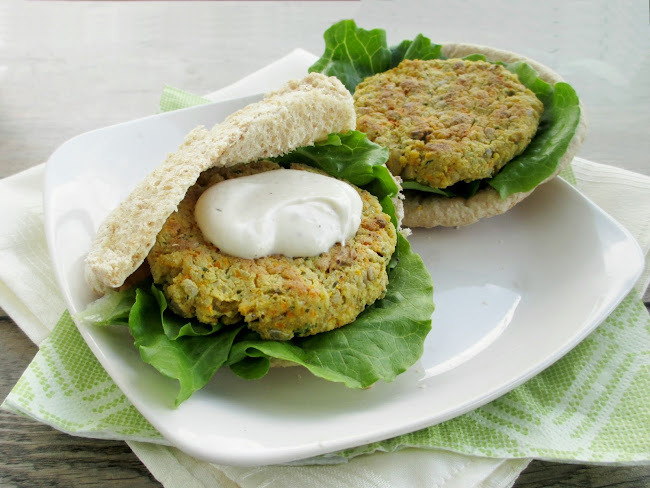 I hear a lot in the blogosphere about the quest for "the perfect veggie burger". It seems like standards are much higher for veggie burgers than regular beef or turkey burgers - they have to have the perfect texture (firm with a bit of crunch to them), hold together well, and have lots of flavour. I guess I would have to say that while I've made lots of different kinds of veggie burgers, I'm still on my quest for one that meets those high standards! Usually my veggie burgers get good marks on flavour, but they barely pass on the texture and holding together well tests. Somehow I always seem to end up with burgers that taste good but are a bit on the mushy side and crumble easily. 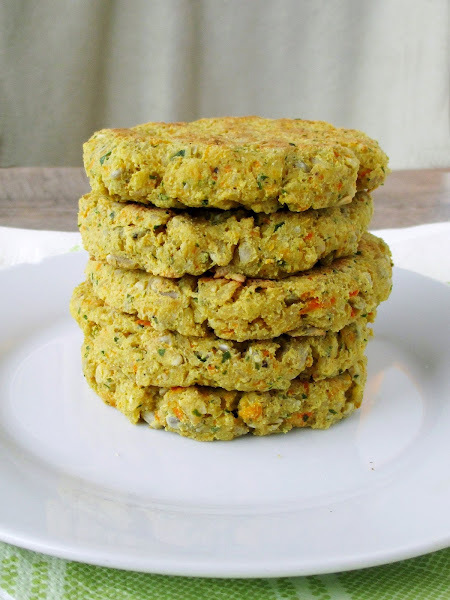 Luckily, I've figured out a couple of tricks to improve on those two veggie burger flaws, and my latest attempt - these tofu sunshine burgers - have both great texture and hold together really well! For the texture issue, I've discovered that brown rice makes a great addition to veggie burgers to add bits of chewiness throughout. The first time I tried using brown rice in a patty was when I made The Vegan Chickpea's Sunshine Burgers. I loved how crunchy they were from the rice and sunflower seeds, so I used her recipe as a guide for these burgers. I combined that recipe with one from Canadian Living for carrot, tahini and tofu burgers. A lot of veggie burgers use an egg to bind the ingredients, but in this vegan recipe, the thick tahini and blended tofu help to act as glue to hold everything together, making for a firm burger that's more similar to a storebought patty than the crumbly, mushy homemade ones that I'm used to. 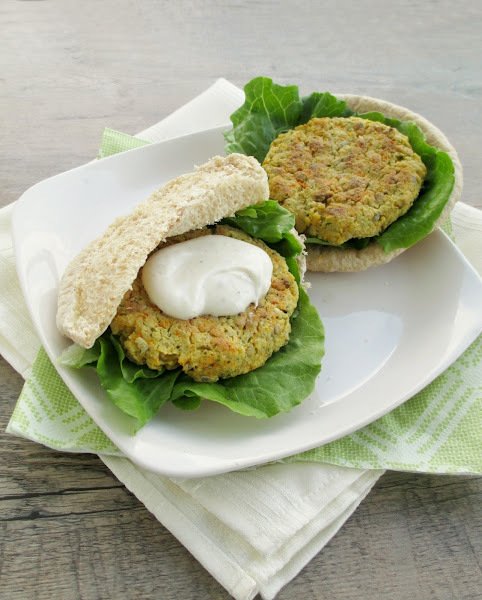 And last but not least, these veggie burgers also have lots of flavour! The spices really come through, especially the curry powder, and the parsley, garlic and tahini add a Mediterranean flair. These work well on a bun or in a pita with lettuce and a creamy spread like hummus, tzatziki, or a tahini-yogurt sauce (which is what I made for mine, shown in the photos). And if you want even more veggie burger inspiration, Courtney from The Fig Tree recently did a round-up of 25 veggie burger recipes, so you can find some more ideas on her list! I've already tried out one of the methods of wrapping the burger in lettuce leaves instead of using a bun with my leftovers of these burgers - a fresh and tasty way to eat them! Preheat oven to 400°F and spray a baking sheet with cooking spray. Meanwhile, heat the olive oil in a small skillet over medium heat. Add the garlic and cook for 30 seconds, stirring. Add the carrot, cumin, and cayenne and cook for another 1-2 minutes, stirring often. Remove from heat and set aside. Drain the tofu and place in the bowl of a food processor. Add tahini, parsley, lemon juice, salt, pepper, and curry powder (if using). Process just until everything is mixed together. Add the carrot mixture and sunflower seeds and process again briefly. Add the cooked rice and pulse a few times until the rice is mixed in. Form mixture into five equal patties, pressing down so that they are evenly flat. Place on prepared baking sheet and bake in preheated oven for 20 minutes, flipping once halfway through, until lightly browned and firm on the outside. Serve warm, with buns, pitas, or lettuce wraps and desired toppings (e.g. hummus, tzatziki, lettuce, cucumber, tomato, sprouts). 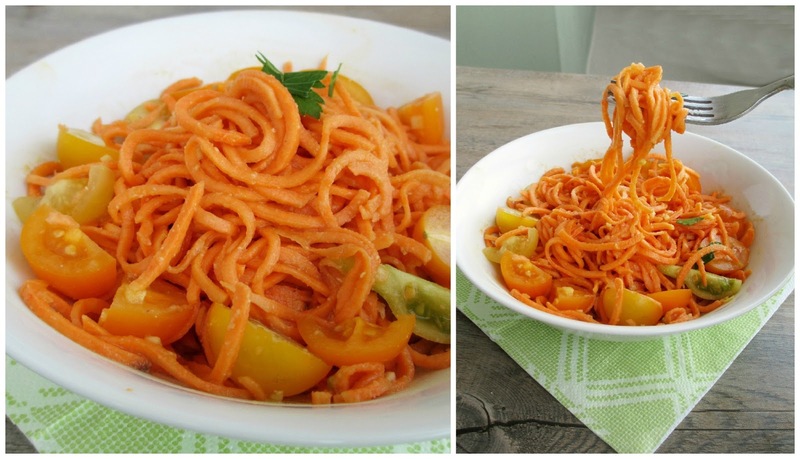 If you missed last week's posts, I finally shared a couple of recipes that used my new spiralizer. 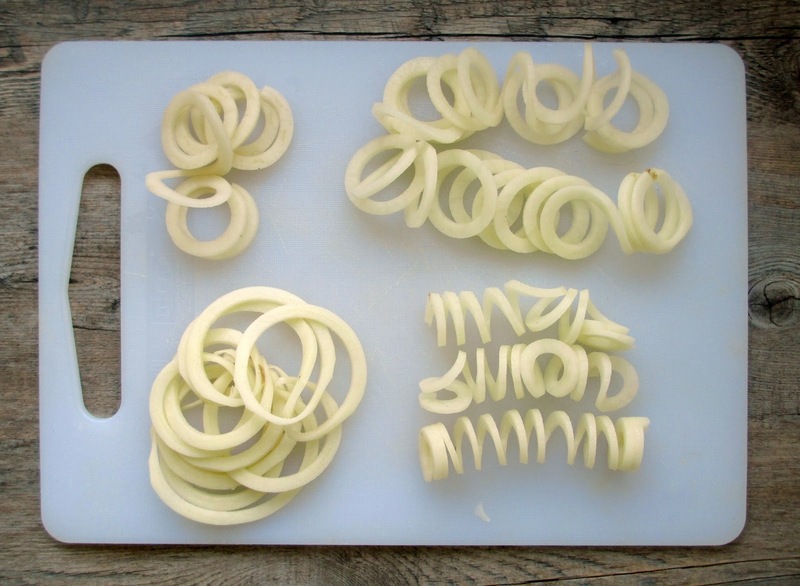 I hope you're not sick of hearing me talk about spiralizers yet, because I'm dedicating a whole post to them today! Since I know there a lot of people who either own a spiralizer already but may not know what to do with it, or people who are considering buying one but aren't sure if it would be worth it, I thought it might be helpful to do another post featuring some ideas for creations that you can only make with a spiralizer. First things first, if you've never heard of a spiralizer, it's a kitchen tool that uses different blade settings along with a pronged handle to crank fruits and veggies into curly, ribbon-like strands. I own the Paderno World Cuisine model, which is made of plastic so it's nice and light, and is really easy to use. The only downside is that it can be a bit difficult to clean and the plastic can stain easily, but the pros definitely outweigh the cons in my opinion! I've had a lot of fun trying out different veggies with my spiralizer to see which ones work best, and coming up with creative and fun meals to eat. This probably sounds lame, but I can't describe how exciting it is to see a zucchini or a potato emerge from the spiralizer as something totally different than how it went in! If you like to have fun with food, then this tool helps you do that! 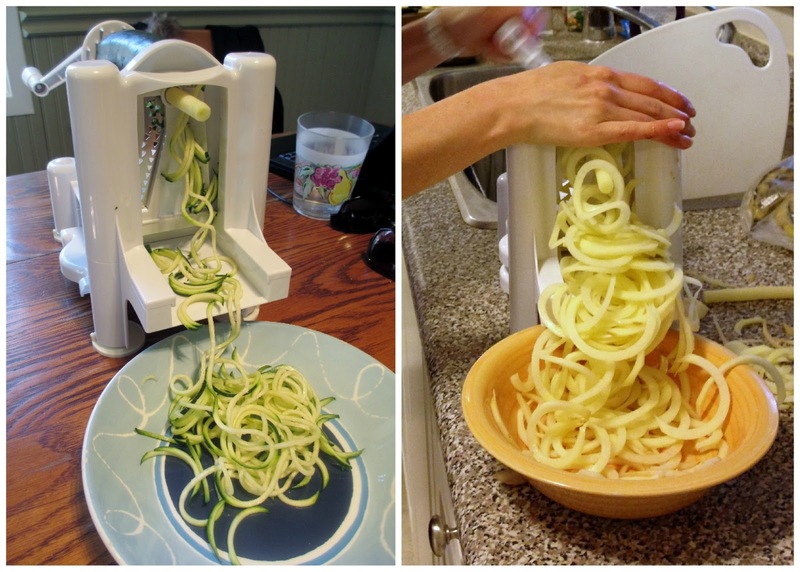 This is probably the most common use for a spiralizer. As long as you start with a fairly straight zucchini, it easily cranks through the machine and turns into long, thin strands that really do resemble spaghetti! 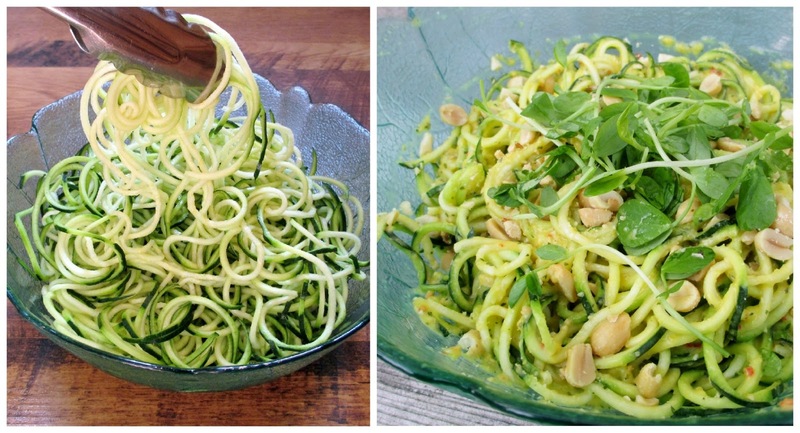 One of the reasons why zucchini noodles are becoming so popular is that it's so easy to pair them with different fresh sauces and other veggies to make a healthy, low-carb meal. The version that I made above is this recipe for mango and mint marinated zucchini noodles from Green Kitchen Stories. I loved the fresh mango and mint flavours, and the zucchini noodles soaked up the dressing nicely. Another easy idea is to make a fresh tomato sauce for the zucchini, like this recipe from Janet of the taste space. You could also go with an Asian sauce like Thai peanut sauce, or blend up an avocado with lemon and herbs. There are so many options and I plan to try out as many of them as I can! 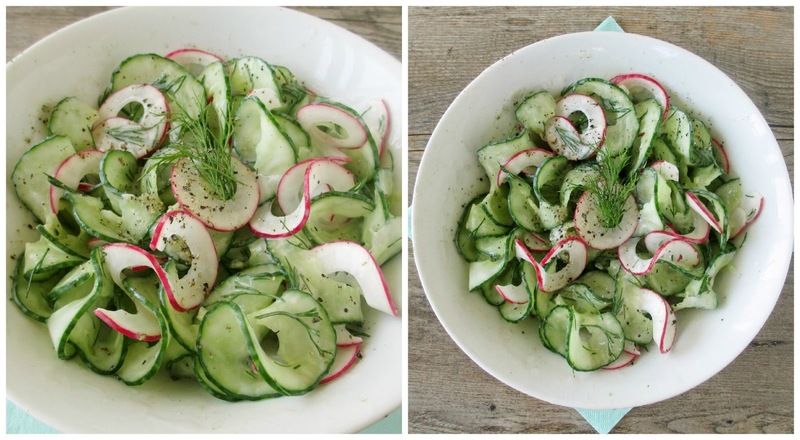 These cucumber and radish ribbons are probably the prettiest looking "noodles" that I've made with my spiralizer. I used the larger blade setting to get wide noodles and tossed them in a simple creamy yogurt dressing with lots of fresh dill. 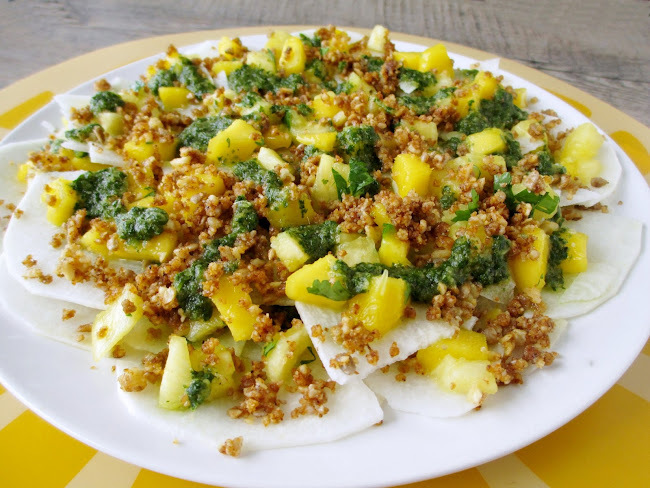 This would make a nice light summer side dish, and I'm sure you would get lots of compliments if you brought it to a BBQ or potluck! 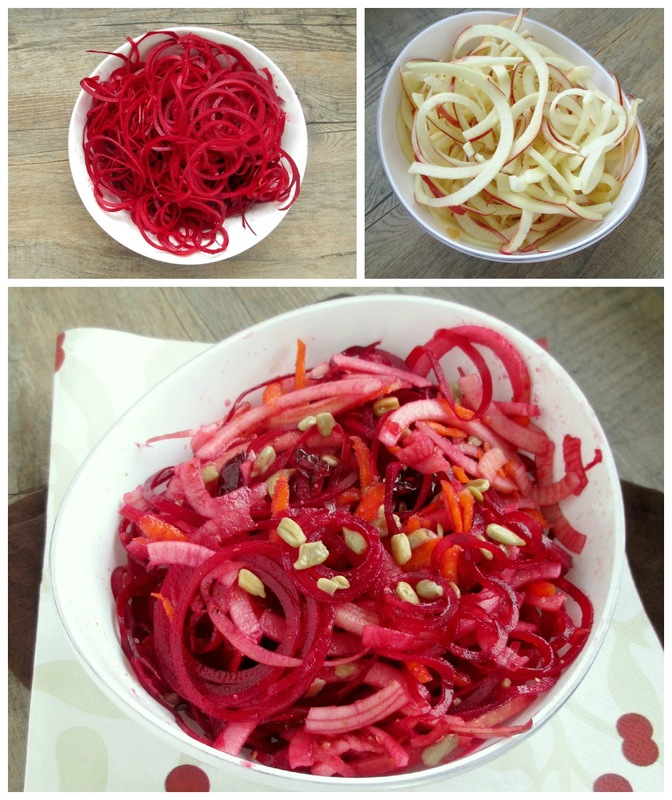 Beets were one ingredient that I couldn't wait to try out with my spiralizer. I love adding raw shredded beets to salads, and with this method you get beautiful long, curly strands of beet instead of short shreds. I also used the medium sized blade to slice up an apple, and it was the perfect salad pairing to go with the beet noodles. Shown above is the salad I made with both the apple and beet, along with some grated carrot (which I tried to put in the spiralizer but it didn't work because it wasn't wide enough), some dried cranberries, sunflower seeds and a bit of dressing. It wasn't the prettiest looking salad, but it sure tasted good with the natural sweetness of the apples and beets. 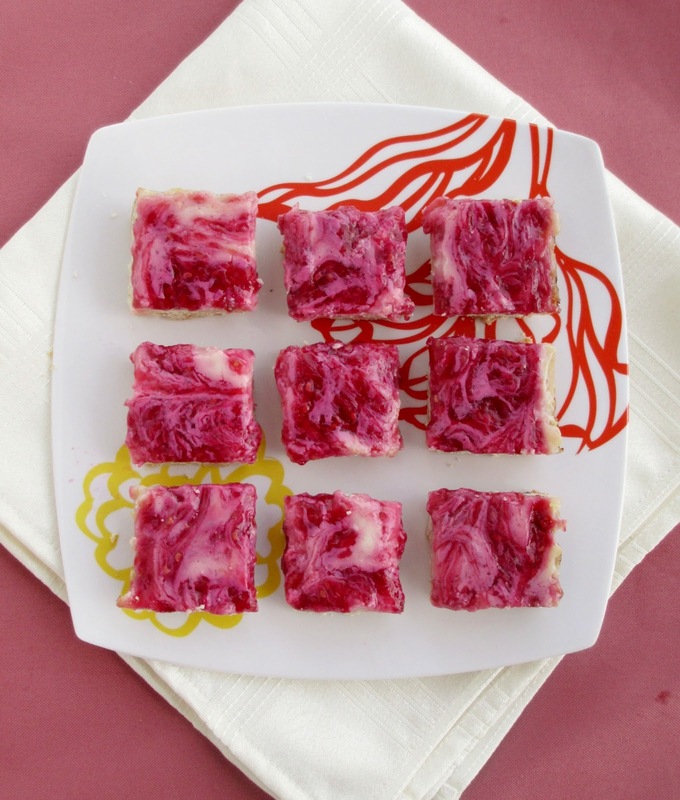 It makes sense to eat apples and beets raw, but raw sweet potato is a bit more unusual! I gave it a try anyway and surprisingly, the sweet potato did turn into nice soft noodles that I could eat raw, or you could also cook them in a skillet first if you want. For the version shown above, I made a miso-ginger dressing and added some tomatoes because that happened to be the only other vegetable in my fridge at the time. It was an odd pairing that didn't exactly work, but at least I liked the noodles! Next time I would try them with something a bit creamier like a tahini or nut butter based sauce, and add some other veggies like broccoli or red pepper. It occurred to me recently that spiralizers aren't only good for making raw vegetable dishes - you can still cook the noodles afterwards. Naturally, a potato seemed like the best ingredient to try this with, and it actually worked really well! 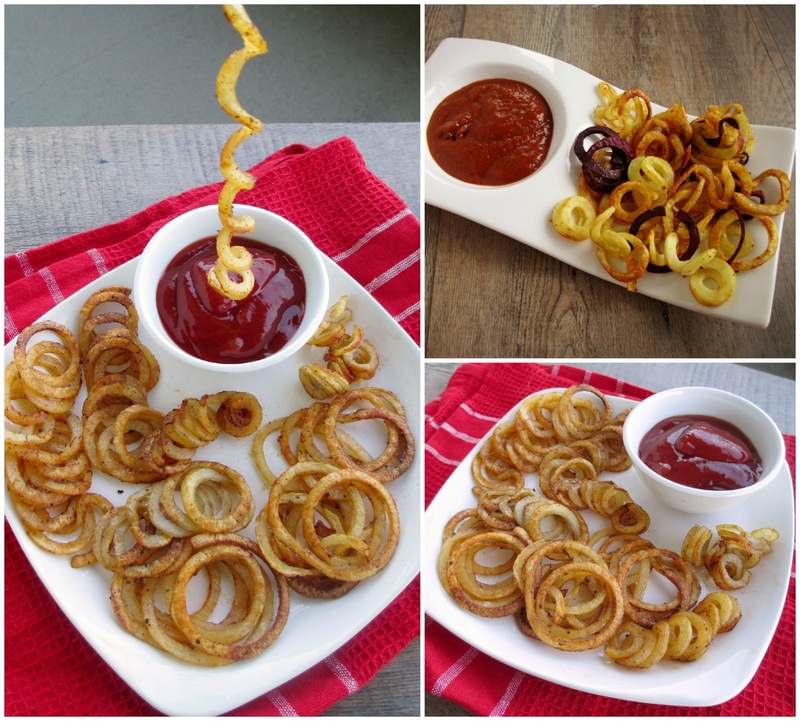 When my sister recently brought up how much she used to like eating curly fries, I thought, hey - why not trying making them myself with my spiralizer? My first attempt (shown in the top right corner) didn't work out so well - I ended up with a few good curly strands and a much bigger pile of unusable shreds, but that was probably because I used a japanese sweet potato and a purple sweet potato, which were a bit harder in texture. I know this post is titled only Five Ways to Use a Spiralizer, but I had to squeeze in my recipes from last week too! 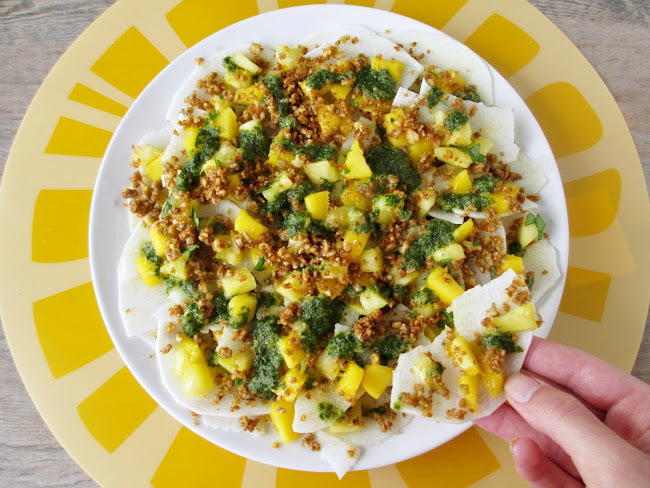 I've discovered that my spiralizer is the perfect tool for making super thin slices of raw fruits and veggies to use as nachos with any toppings you like! 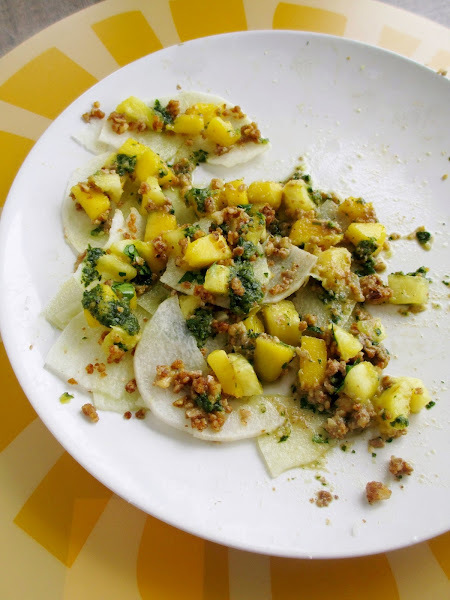 So far I've tried this method with apples to make these apple nachos with peanut butter sauce, pecans and coconut, and with jicama to make these raw jicama nachos with tropical fruit salsa, taco nut crumbles and lime-cilantro sauce. Both snacks were super tasty, fun to eat and healthy too! Note: The opinions in this post are all my own. I have no affiliation with any companies that sell spiralizers nor did I receive any kind of sponsorship for this post. I simply wanted to share my experience and recommend a product that I enjoy along with some recipe ideas! If you read my birthday recap post back in April, you may remember that I was given a fun new kitchen toy that I was really excited about: a spiralizer. Even though I haven't posted any recipes yet using my spiralizer, I have definitely been busy testing it out! One of my favourite discoveries so far is that it isn't only useful for making noodles out of vegetables - it actually has three different blades ranging from skinny to wide, and the wide blade can be used sort of like a mandolin to make thin shavings. After brainstorming about what I could make with this handy setting, I remembered an idea I had seen throughout the blogosphere for making apple nachos. 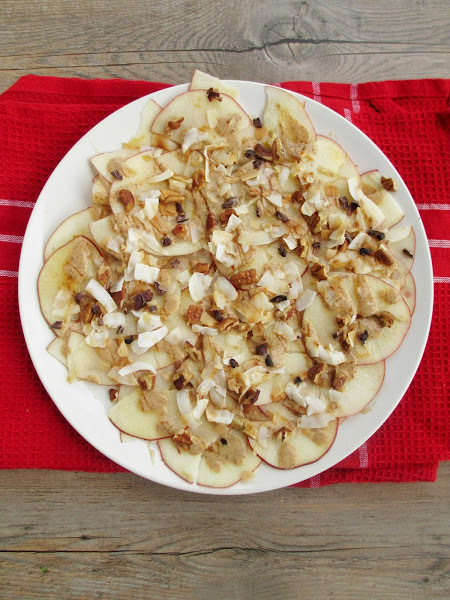 The basic idea is to layer thinly sliced apples on a plate, sprinkle them with your choice of sweet toppings, and voila - you have apple nachos! Most of the recipes that I've seen turn the nachos into more of a dessert with toppings like caramel sauce, chocolate chips, and marshmallows, but I wanted to make a healthier version that could be eaten as an afternoon snack. For my version, I made a peanut-cinnamon sauce using another one of my birthday gifts, PB2 powdered peanut butter, and used toasted pecans, coconut flakes, and raw cacao nibs as the other toppings. I actually wasn't even planning on sharing my snack on my blog, but I ended up liking it so much that I had to post the recipe! 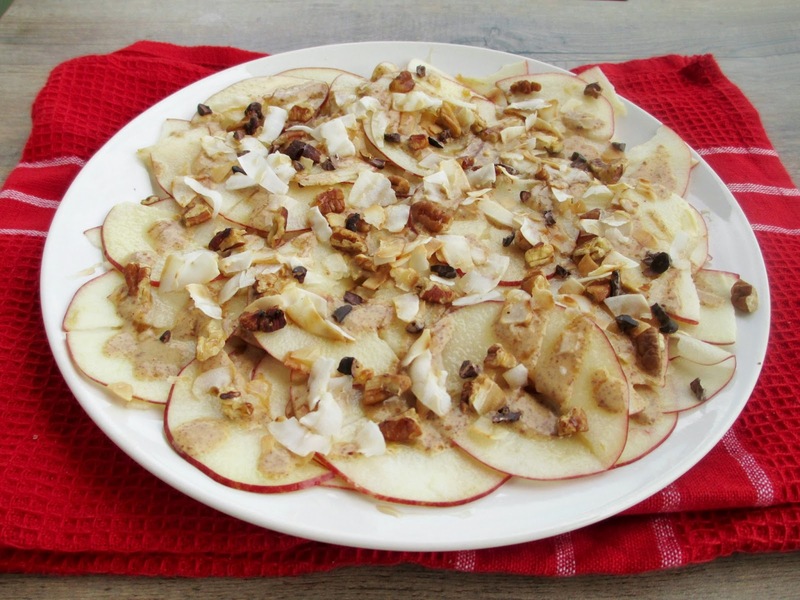 I loved the texture of the apples - slicing them so thin made them taste extra light and crisp, and they could easily be bent to scoop up the toppings. I also liked the mixture of crunchy nuts and cacao nibs sprinkled on top, and my favourite part had to be the tasty peanut-cinnamon sauce - yum! I think this would be a fun snack to make with kids, or for anyone looking for a healthy treat that still tastes like dessert. And stay tuned later this week for another version of raw nachos! Start by making the sauce: In a small bowl, whisk or stir together the PB2 and almond milk until smooth. Stir in the cinnamon. Set aside. (Note: *If you don't have PB2, I would suggest using 1 tbsp peanut butter and either thinning it with a bit of almond milk or yogurt, or melting it in the microwave as the original recipe suggested). Heat a small skillet on the stove over medium heat. Add pecans and toast for a few minutes, until browned and fragrant. Remove from pan and set aside. Add the coconut flakes to the skillet and toast briefly, just as soon as they start to turn brown. Remove and set aside. Slice your apple using the largest blade on a spiralizer (Note: I cut a small slit a few millimeters deep down the length of the apple first, from top to bottom, so that I would end up with separate apple pieces rather than a long unseparated strand). 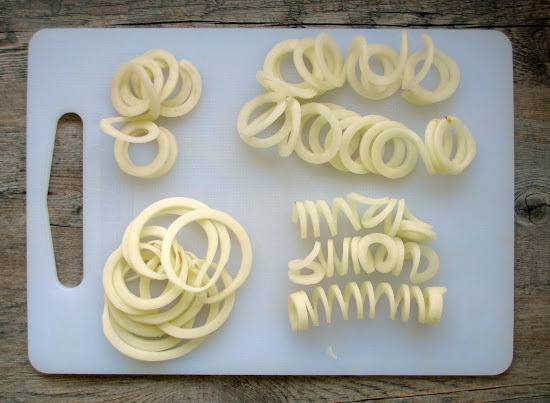 If you don’t have a spiralizer, you could try using a mandolin, or use a knife to get as thin slices as possible. Once you’ve gone through half of the apple, drizzle the slices with lemon juice to prevent browning. Finish slicing the apple and drizzle more lemon juice over the slices. 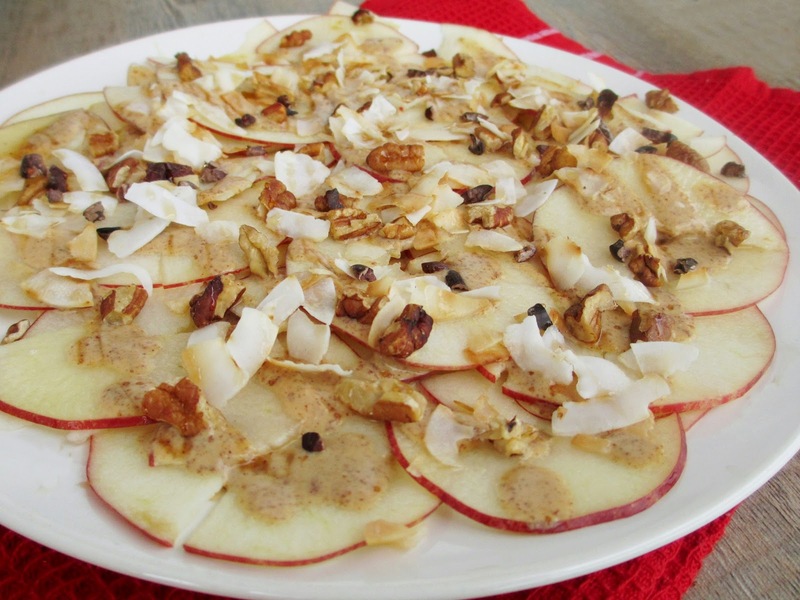 Spread the apple slices out on a large plate. Drizzle the peanut sauce over top, then sprinkle the pecans, coconut flakes, and a handful of cacao nibs on top. Finish with a tiny drizzle of maple syrup if desired.